Over the Christmas holiday, BAH unplugged and went off the grid for a while. There was no browsing or blogging or chatting. It was an email free zone. And it was lovely. Instead of scrolling through web pages, I turned pages of books. Instead of jumping around the internet, I moved game pieces around a board. Instead of virtual chatting, I saw people in person. And I spent a considerable amount of time trying to learn to speak a new language. All because of my new obsession up there. For the last three years, I’ve been using Canon point and shoots for all my picture taking needs. You might say that I was fluent in Canon. I knew how to flip through the menus, manipulate settings, adjust white balance, spot meter, and point and shoot my way around. But I also knew that the point and shoot’s days were numbered. For the second time in three years, my camera has decided it has had enough. The signs are subtle, but they’re there. It randomly switches over to video or scene mode and the focus is all wonky. Soon enough, Elf 2.0 will stop working altogether. These are not good behaviors in a camera. So I started thinking about what would replace Elf 2.0. 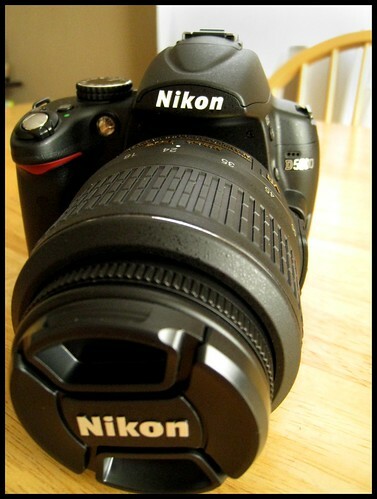 And I decided it was time to take the plunge and get a DSLR. As user friendly as Elf 1.0 and 2.0 were, I didn’t have as much control as I wanted with them. I couldn’t override the auto focus, I couldn’t switch out lenses, and I couldn’t play with shutter speed or aperture. And I’ll admit to developing an extreme case of camera envy from looking at other food blogs and their incredible, vibrant photos. So why in the world would I go from being fluent in Canon to being unable to speak a word of Nikon? Because having not one, but two Canons fail in three years does not give me a warm fuzzy feeling about spending considerably more money on a more sophisticated Canon product that would be harder to replace in the event of another failure. Sorry Canon, you had your chance. This is a long term investment for me and I couldn’t justify making it with you. I’ve read and reread the owner’s manual and much of what D does is still beyond my understanding. But I’m slowly starting to figure a few things out. In a perfect world, I would be able to turn off the flash in manual shooting modes. Or I would be able to manipulate shutter and aperture in flash off mode. Or it would be easier to set a manual white balance value. Like the time when I decided to change to German in college after four years of French, there’s a lot to learn. Actually, that didn’t go so well so maybe I shouldn’t use it as an example. Only time, and the pictures, will tell. If you speak Nikon, and have any tips, suggestions, or resources, I’d love to hear them. The Nikon manual was pretty much greek to me, so I bought this book http://www.amazon.com/David-Busch%C2%92s-Nikon-Digital-Photography/dp/1435454979 and it has helped me a lot! Yeah, our cameras are cousins. I will definitely check out that book because the manual makes me feel stupid. I’m already scheming on how I can start collecting lenses without alarming The Mistah. The folks at Service Photo on Falls Road suggested a very budget friendly solution for a macro lens workaround. For the time being, I’m working with a set of macro filters. At 1/10th the cost of a lens, it was a win-win. How exciting! I am a lover of all things Canon. When we researched it, Canon’s lenses were cheaper and the body was smaller so it was the winner. My pal Mel just got her little hands on a Nikon and fares well with it. Can’t wait to see what you cook up next! I really did love my Elfs. I hated switching brands but I didn’t want to take a chance that I’d still be plagued with failing processors after such a short time. I have already been shooting a lot of everything to try and get familiar with D. For instance, http://www.flickr.com/photos/pmf1852/4222323980/ is one that I think really shows the increase in texture and depth I can get with the D that I couldn’t get with the PAS. I’m headed to Border’s this week to pick up a book or two to try and make me feel less stupid. And I’m starting the lens fund in my piggy bank. I did buy a 55-200 telephoto almost immediately (and used it extensively on my trip to France this summer). I asked my mom for a 35mm prime lens for Christmas, which I think will be great for in the kitchen shots. And Noel got me a flash for Christmas (SB 600!) and it’s already making it a lot easier to get natural looking picture in the kitchen after dark! 35mm prime? Was ist das? I have a feeling that my blogroll and blogreader are about to explode with photo sites. Yay congrats on the new camera! The next time we get together we should all powwow with our nikons and talk about the settings! LOL. We definitely need a Nikon powwow! Wendi, I can really see the difference in those pictures. They’re fantastic! Thanks Beth. I love how my colors seem richer and deeper with the D. And so far, I feel like I don’t have to do as much Picniking to them. I think our cameras would like a play date ladies! Have fun hun. I had a Nikon and the darn thing was smarter than i was. I have a Canon now. and a SONY PAS that goes everywhere. As crazy as it may sound, when Elf 2.0 dies I intend to get another PAS. I’ve gotten so used to being able to pull a camera out of my purse when I’m out that I wouldn’t know what to do without one. So I’m going to start saving my pennies now because I don’t know how much longer it’s going to be before I have to replace it. Awesome! Congrats on your new toy! As a person who can barely work a point-and-shoot, I applaud you! I have two goals for 2010 – break out of my point and shoot life and face my fear of yeast. Hopefully, Big D will help with the first. And The Bread Bible may help with the second. I agree – having a camera handy is super nice. The phone cameras just aren’t as snazzy yet. One thing to keep in mind is every camera has a shutter life. Your new Big D has a 100K cycle (the average number of times the shutter fires) whereas my XT has a 50K cycle. When purchase a PAS, they are smaller cameras with not as much punch to pack and will wear out much faster than a dSLR. But by having your Big D, you won’t be using your PAS as often and it should last longer. I learn something new every day. I had no idea about shutter life. It could certainly factor into the short lives of my Elf’s since I used them constantly. So I can justify another PAS to The Mistah by saying that having Big D will make Elf 3.0 last longer? Didjya hear that Mistah? I have to spend money to save you money….I swear. shutterlife? so does this mean I should stop taking a million pictures of everything because my camera is going to die faster? eek! Beth, all this camera tech speak is new to me. I’m hoping to get at least 5 years out of Big D, if not more.